A strong yen and simmering fears of a trade war, triggered by U.S. President Donald Trump's move to impose tariffs on Chinese goods, could further undermine corporate morale if threats of retaliation escalate, analysts say. "Yen gains since late January have eroded manufacturers' sentiment but solid global economic fundamentals helped offset the pain. Overall, you can say that business confidence held firm," said Yuichiro Nagai, an economist at Barclays Securities. "Fears of a global trade war have had a limited impact on business sentiment so far. But depending on development of U.S. trade policy, protectionism could weigh on the outlook." An index measuring big manufacturers' confidence fell by 2 points to plus 24 in March, the Bank of Japan's quarterly "tankan" survey showed, roughly matching a median market forecast of plus 25. Non-manufacturers' sentiment worsened by 2 points to plus 23 against a median forecast of plus 24, deteriorating for the first time in six quarters. Both big manufacturers and non-manufacturers forecast business conditions would sour three months ahead, the tankan showed, reflecting looming uncertainty over the fallout from Trump's trade policy and a strong yen. "This should not be taken as turning point for Japan's economy although sentiment deteriorated slightly," said Takeshi Minami, chief economist at Norinchukin Research Institute. "Concerns are high over possible retaliation against U.S. tariffs, but the global economy remains in a gradual recovery which is good for Japan's value-added exports." If the yen's gains continue, manufacturers may be forced to cut their optimistic profit forecasts - a worry for Prime Minister Shinzo Abe who is pursuing growth with reflationist policies. 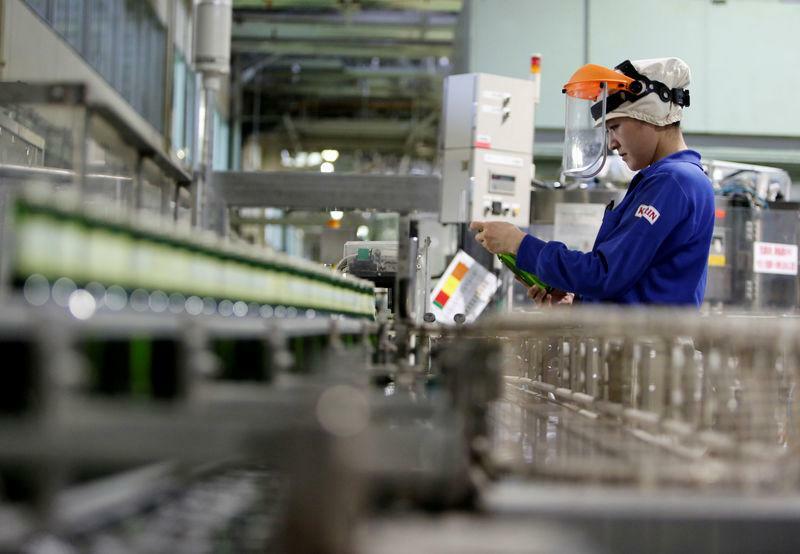 "Labour shortages are having a negative impact particularly on labour-intensive service-sector firms," said Satoshi Osanai, senior economist at Daiwa Institute of Research. He said rising wages could stoke a "virtuous growth cycle" of consumer spending, rising prices and increased investment if companies could pass on their higher costs to generate profit. "The key to making this happen is whether consumers are willing to spend their increased earnings, but so far there's little sign of that happening." Slow wage growth and companies' reluctance to raise prices have kept inflation well below the Bank of Japan's elusive 2 percent target. The index measuring steelmakers' sentiment fell 9 points, the biggest drop among big manufacturers, while confidence also slumped among producers of nonferrous metals and metal products.